← Wheat Yields To Fall (As They Continue To Rise)! Bottom part of linear negative trend or bottom of cycle? See here this time next year. Oct 9th \\ The Arctic is warming twice as fast as the rest of the planet. That’s certain to impact on the weather we experience in Britain. Physicist Helen Czerski and a boatload of international scientists have just spent a month at the North Pole conducting experiments to find out much more about the impacts of this extraordinary change to our planet. Given that the rest of the planet doesn’t appear to be warming very much (see latest UAH data), twice that amount doesn’t seem like anything to worry about. What data do they use to determine the “extraordinary” Arctic warming? “Is warming twice as fast” is well past its sell-by date, hence being milked to death. Warmed twice as fast a few decades ago … just doesn’t make the grade in eco-marketing 101. It makes you shudder, where is the Ursa Major when you need one? yeah, even more mental than before when it was just moonbat like, prince chucklechops, of the NSIDC serreze and cambridge fixation man ‘sea ice death spiral coming very, very, very oh so soon’ wadhams. Czerski’s North Pole research has been covered a lot on BBC R4 Science progs, no doubt they were hoping for “no-ice”, but when that failed to happen she described what they were doing, which is just to get better data on ice-atmosphere interactions. The talk about rapid changes is just BBC promotional hype, but will no doubt form a major part of the upcoming prog, given what we know about green activist infiltration of the BBC. Everything in nature that shows a trend in an undesirable direction is not therefore caused by global warming. So how many Wadhams are left? What is very striking to me on the DMI plot is the pattern of the residuals – the differences between the trend line and the observations. In the 1990s and early this century most of the residuals are positive, followed by a run of negative values through 2012, and a return to positive values thereafter. Anyone running statistical tests for serial correlation would see alarm bells ringing on the assumption of a linear trend. Correcting the regression calculations to take account of this would reduce the certainty of the slope coefficient and the correlation coefficient. Such a pattern of residuals isn’t really consistent with the linear assumption. It strongly suggests a model with a curve in it – for example a cycle. I suspect there is enough to largely debunk the linear assumption, even though the data aren’t formally outside the supposed confidence limits if you wrongly stick with the assumption of random, normally distributed residuals. I’m increasingly tempted to find the underlying data and do the formal analysis with Durbin-Watson statistics and the rest of it. Far too much science is published without anybody asking the obvious questions. Linear regression assumes that residuals are random ( and occur with “bell curve” probabilities). That means that there should be a 50:50 chance of a residual being above ( or below) the trend line, just as with coin tosses. As a first approximation we can consider just the sign of residuals (more sophisticated analysis takes full account of their magnitudes as well). With coin tosses, the probabilities of a sequence of heads and tails of a given pattern and length are easy to calculate. The sequence HTTTTTTHHHHHH that occurs at the end of the chart has a probability of just 0..5^13 or about 0.012%. If you allow that the sequence might occur anywhere along the 40 data points, you could multiply that by (40-13)=27 which is still only 0.33%. In short, it is very unlikely. Also – even more basic – time is not a causal variable. That’s pretty much an admission that they know that to produce the trend in this way is wrong, but they’re doing it to stay in step with NSIDC. Of course, the likes of Wadhams throw caution to the winds. 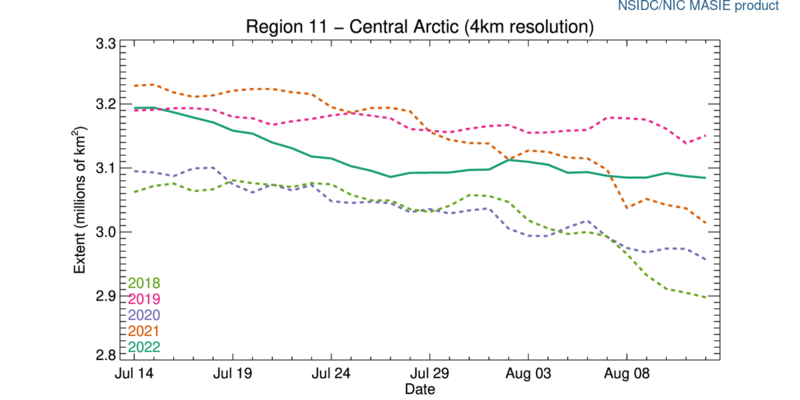 Meanwhile, someone should ask what happens when the predicted sea ice from the linear trend turns negative, and again when it exceeds the surface area of the Arctic/Earth, and how they factor in Milankovitch cycles in the Earth’s orbit. Great news! How many lives will this save? You mean there is still Arctic ice? How inconvenient. Solar minimum is imminent. Already 158 days without sunspots this year (2011-2015 grand total = 3). The longer the quiet sun continues, the weaker Cycle 25 probably will be. It is all very interesting, but it will take several years to play out. Regarding the interesting theory that CFC’s had an effect on climate in the last fifty years, which will be reversed gradually now that further emissions are banned – that will take even longer to be tested, as the gases reduce only by 1% a year. I see your point and will take contact to the group responsible for the text. Truth moves very slowly in Denmark. They are on the horns of a dilemma. They do not want to believe their instruments, but if they call the instruments liars (as their confreres are probably urging them to) their lives’ work is garbage. 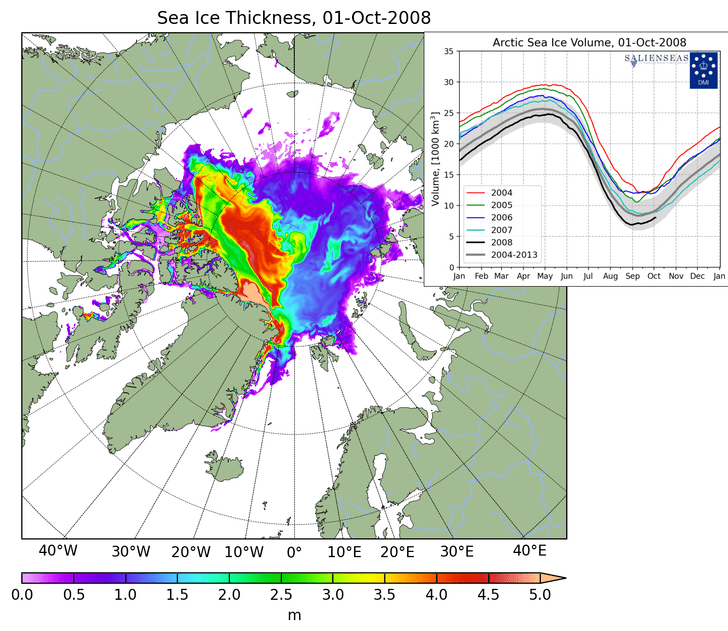 Arctic ice comes, Arctic ice goes. Same as it ever was…. I am an old man, just past three score and ten, and I prefer warmth to cold. The DMI Arctic surface temperature was dropping like a stone pretty close to average, but has spiked back up and remains very warm. Other sources also show a very warm Arctic anomaly. 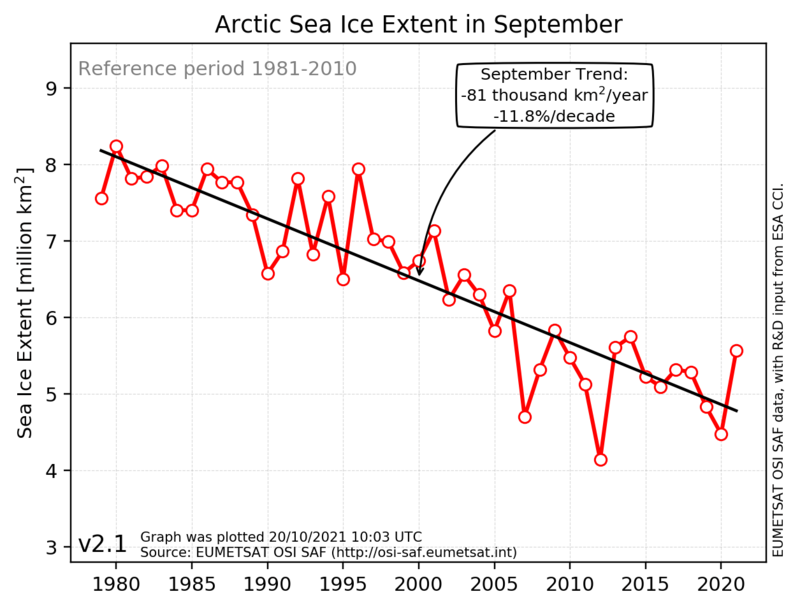 What is odd is that the ice still seems to be reforming at a similar rate to ‘usual’. I can only assume that the warmest air is away from the advancing ice edges? Anyway, just shows yet again, there is no such thing as ‘normal’ in the Arctic. Go out there in your birthday suit, and see how long you think this! You will lose consciousness in an hour, be dead in a day, and a solid lump that even a polar bear would despise in two days. All that has happened in the Arctic is that the very coldest air has moved to Canada and Greenland in a cold wave, and been replaced by less cold air from further South. A simple swap…happens all the time! I think you would survive quite well, +10C above where it should be now and barely averaging below freezing. Yes, I know where the cold air has gone, my point was that this is unusual at this point in the season, yet the ice was still increasing, although the effect of the warmth is now beginning to tell and ice formation is showing signs of slowing/stopping. At some point there will be a dramatic plunge in temperature, that much is inevitable. The air needs to be + 5 C for any melting to occur from direct contact with the atmosphere. I do not know if the incoming air is particularly moist – that always increases melting, as condensation of one molecule of H2O onto the surface releases enough heat energy to melt out seven molecules in the ice. Of course, the main melting happens every year because of direct sunlight – which now is weak in the Arctic. 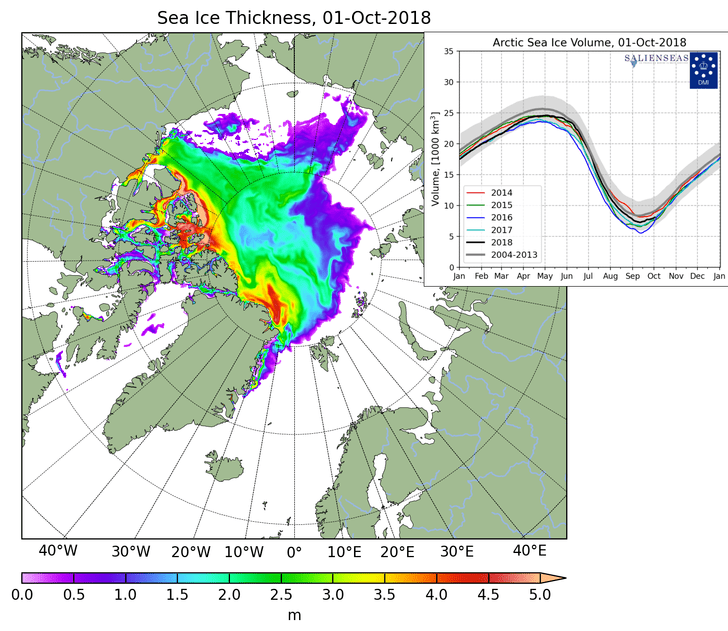 It seems that, rather like last year, thin sea-ice to the north of the coasts of Alaska and Siberia continues to clear or disperse, while the sea-ice on the side of Canada and Greenland is already thickening. As you imply none of it really matters; the season has changed, and that is that.